MARGATE/FL – He sends out messages to his contacts at 2am and then normally is chatting at around 4am as well. In between he catches something call sleep. This is the life of cricket administrator and businessman Mahammad Qureshi. His work in the development of cricket is on par with the best in the business and even surpasses them at times. With the 2018 US Open T20 tournament approaching, Qureshi has been burning the proverbial midnight oil. He has been flying around the United States, meeting with team owners and investors and is selling the game of cricket to unknown parts in North America. He has been breaking barriers by going into traditionally non-cricketing areas and meeting Corporate America, who is being introduced to the sport for the first time. Just a typical day in his life can give a glimpse as to what this man does for the development of cricket. On Wednesday, he was in Atlanta and found the time to convene five meetings, including negotiating with some team owners in order to get them ready and in line with what is required in terms of taking part in the 2018 tournament. He also held meetings with corporate bodies looking to see where they can fit in, as far as this carnival of cricket is concerned. His flight was due to leave at 10.15pm from Atlanta airport bound for Hollywood International airport in Fort Lauderdale. He stopped on his way to meet some interested cricket party to give them his expert views on cricket development in Atlanta. He reached the airport at 9.05pm, in time for his flight, only to realise that his travel bag was not with him. On making a few calls he realised that it was left at the hotel lobby where he was conducting another cricket meeting late in the evening. The time from the airport to Downtown Atlanta was 35 minutes and to get back to the airport around an hour and 10 minutes without traffic. An offer was made to him to have his bag sent by FedEx to Fort Lauderdale because he would have missed his fight. After agreeing, he remembered that he would have needed documents from his bag for early morning cricket meetings and decided to jump back into his friend car to do the impossible. They were able to get to the hotel and back to the airport in 50 minutes and just as he ran into the airport, movie style, the gates were closing. He was able to just make it and immediately re-started working on the flight. He got in at 1am into Fort Lauderdale, sent out his customary messages to his cricket people and then retired to bed around 3am. Before you know it, he was up and ready to move, making an early call to his media manager to start another day of cricket meetings. 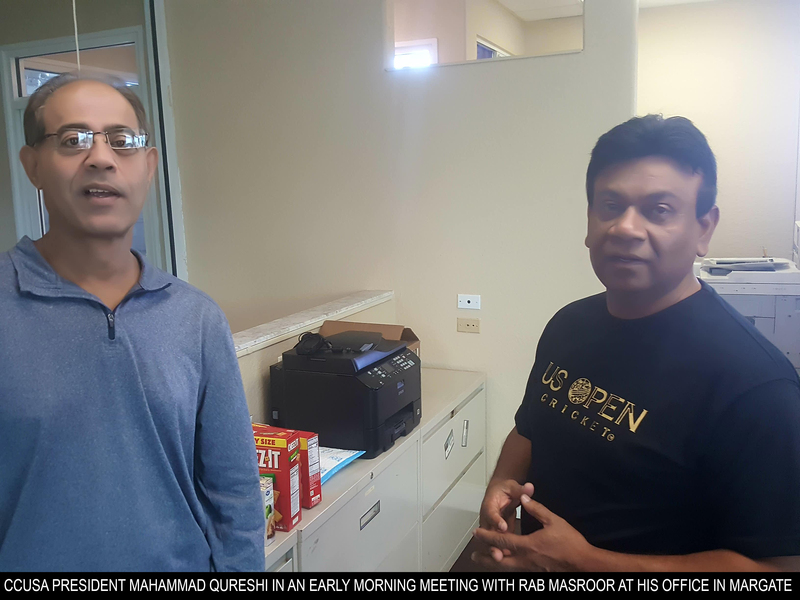 With bloodshot eyes, he turned up at his Cricket Council USA (CCUSA) offices in Margate and when told about the condition of his eyes, all he said was that he was energised because cricket needs the work.